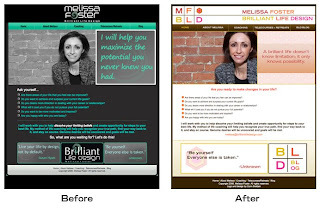 Last week I created a new logo and helped transform a website for Melissa Foster over at BRILLIANT LIFE DESIGN. The structure of the previous website was fine and in working order, but it needed a bit of a face lift. I began by selecting a more upbeat and warm color palette, then created a new logo. Melissa had expressed her love of the color orange and that she wanted something very simple and very clean, not only for the logo, but for the website and blog. Here is a before and after. As you can see, the layout is pretty much the same, since I just used what she already had. It worked just fine, so there was no real need to change it. In all, it took about 2 weeks from initial concept to final product. We should be getting the business card printed in the next week or so, so stay tuned for that. In the meantime, stop by and have a look.